Trader Joe's Frozen Papaya Discontinued. Bring it Back!! UPDATE! 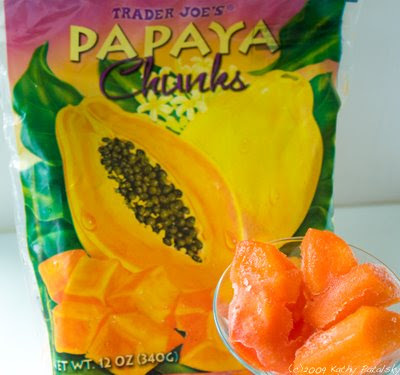 Last night, I was tipped off by a helpful blog reader about some sad news: Trader Joe's has discontinued one of my favorite products, frozen papaya chunks. Weepy and confused, I called the TJ's at Union Square to confirm this news. Yup, my beloved frozen papaya chunks that blend up some of my favorite frosty summer smoothies - have been given the big D: discontinued. Sad. Bring Back the Frozen Papaya! I sent TJ's an email today, urging them to bring back this healthy and happy frozen product. If you crave easy, affordable and delicious papaya smoothies just as much as me - I urge you to contact them as well and pass on this post to other smoothie-fanatics out there. You can contact Trader Joe's here. My original frozen papaya product review post follows.. Frozen Papaya Chunks at Trader Joe's. I spotted these Frozen Papaya chunks at my NYC TJ's. And tomorrow I'll be featuring a delicious smoothie that will leave you dreaming of papaya bliss. Shelf Appeal: Nice sturdy plastic bag. Holds two servings of Papaya. Pretty pink papaya on front. Label Check: 55 calories per serving, two servings per bag. Wow! That's quite a nice diet smoothie! Plus papaya is rich in the enzyme papain and other nutrients like potassium and Vitamins C and A. Plus the only ingredients in the bag are 100% pure papaya. Yum. Taste Test: I like to thaw out frozen fruit and taste test it. Sometimes the thawed fruit is tasteless and mushy. The good brands will have thawed frozen fruit that is bright with zingy flavor and texture. This papaya was fabulous! It had a sweet tropical flavor and the texture remained firm, not mushy. I was very impressed with the flavor. Plus when I tried it in a smoothie it held up very well and the flavor of pure papaya tickled my taste buds. Price Check: $1.99 for one pack. Great deal to me. The pack looked flat and small but I can easily get three smoothies out of that pack. Last Word: Finally my Frozen Papaya prayers have been answered! 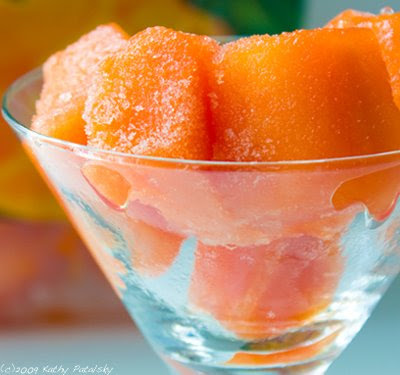 Welcome to the summer of frozen papaya smoothies. Thanks Trader Joe's.